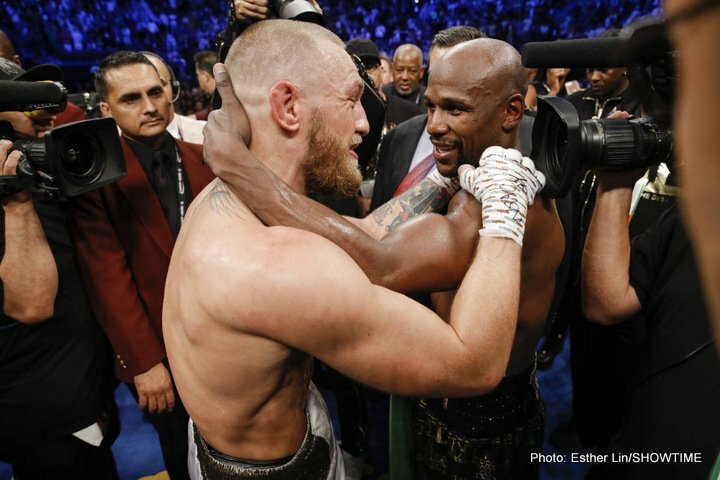 As fight fans know, Floyd Mayweather Junior reached the incredible milestone of 50-0 as a pro boxer on Saturday night with his stoppage win over a debut-making Conor McGregor. However, not everyone is willing to accept that “Money” has really, truly, honestly beaten heavyweight legend Rocky Marciano’s famous 49-0 ledger. One of these people is Rocky Marciano Junior, who told The New York Post that in his opinion Mayweather’s 50th win came in an “exhibition” bout and that Floyd’s 50-0 record should have one big asterisk placed on it. On paper, Mayweather’s 50th win counts, as the McGregor fight was sanctioned as a pro fight, but many people agree with Marciano Junior’s take on things – Bob Arum included. In any case, as Marciano’s son says, Rocky’s record, for being the only heavyweight king to have retired unbeaten, still stands. Marciano Jr. spoke of how his father was very much tempted to attempt to reach 50-0 himself, being offered somewhere between $800,000 to $1 million – an incredible sum back in the 1950s – to come back. It’s very possible that had Marciano gone ahead with what would’ve been his 50th fight, he would have lost (he would have fought the super-fast new champ Floyd Patterson) and we would not now be having a debate over whether or not Mayweather has or has not beaten his 49-0 record. Marciano, at 49-1, would not be the towering boxing immortal he is today. But Marciano was smart and he stayed retired. Will Mayweather – whether you view him as 49-0 or 50-0 – do likewise?